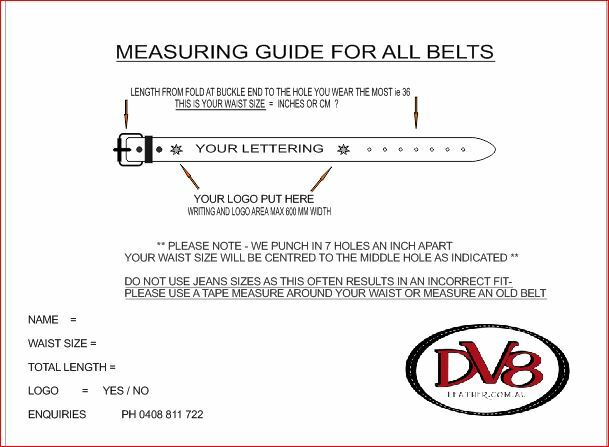 The King of Kings is a design we have been asked about a lot - Laser engraved leather belts are a specialty of DV8 Leather. This belt is made with fine grained veg tanned leather 38 mm wide with wax burnished edges then stitched in a heavy weight 20 tkt solar bond UV resistant thread. Your choice of paint filled lettering is available in primary colours . \We use a stainless steel buckle as shown i picture with heavy duty snap fasteners so you can swap buckles easily. Please allow two weeks for us to manufacture this premium grade leather belt. Enquirers please call us on 0408 811 722 to discuss.